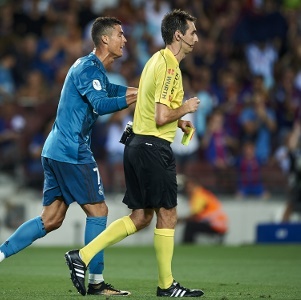 Madrid - Cristiano Ronaldo will be suspended for Real Madrid's Spanish Super Cup, second leg against Barcelona on Wednesday evening after his appeal against a five-game ban was dismissed. The Spanish football federation's (RFEF) appeals committee "dismissed the appeal presented by Real Madrid", the RFEF said in a statement on Wednesday. Ronaldo will also be absent when Madrid begin their defence of La Liga on Sunday at Deportivo la Coruna as well as home games against Valencia and Levante and a trip to Real Sociedad. The World Player of the Year was controversially sent off in Madrid's 3-1 first-leg win on Sunday for a second yellow card when referee Ricardo de Burgos Bengoetxea adjudged he had dived trying to win a penalty eight minutes from time. After being shown the 10th red card of his career, Ronaldo then lightly pushed the referee. On Monday the RFEF issued Ronaldo with an automatic one-game ban for the red card plus an extra four-match suspension for the push. Madrid boss Zinedine Zidane expressed his anger at what he believes is an excessive punishment. "When you look at everything that happened, to think Cristiano won't play five games with us... it is infuriating," Zidane said on Tuesday. The Portugal captain will, though, be free to play when Madrid begin their Champions League campaign on September 12 or 13.